Fallout picks up several years after the events of Rogue Nation. Agent-turned-rogue Solomon Lane (Sean Harris) - our returning villain - has been locked away, with several nations looking to take a crack as getting information out of him. But that doesn't mean his network of terrorists, dubbed The Apostles, have slowed down. While the CIA, led by top agent/assassin August Walker (Henry Cavill, his stoicism and serious face working for once), who has been wiping out the bad guys like roaches - but, like roaches, you can never get them all. Ethan Hunt (Tom Cruise - at the top of his action game even after all these years), along with Luther Stickell (Ving Rhames) and Benji Dunn (Simon Pegg) are given a crucial mission to recover three plutonium cores to stop them from falling into the hands of the Apostles, who have co-opted a nuclear scientist Nils Debruuk (Kristoffer Joner) to help them build three bombs with the ability to wipe out any city across the world. While at first the mission seems to be going off without a hitch, Hunt chooses his team over the mission, and the cores are lost. IMF boss Alan Hunley (Alec Baldwin) has a lead on the cores - a young philanthropist/arms dealer dubbed The White Widow (Vanessa Kirby) is holding an exclusive party where the handoff will take place, but even before the mission starts, CIA head Erika Sloane (Angela Bassett) arrives and says the missions will not happen without Walker going along for the ride. Hunt has no other option but to let the agent tag along. And, of course, nothing goes as planned. This does bring us to one of the major strengths of Fallout - the amazing stunts. You see, in order to infiltrate this party/meeting Cruise gets to pull off an amazing HALO (high altitude low opening) parachute jump. And this is no stunt double - Cruise (and Cavill too) trained long and hard to get the perfect shot and timing - no easy task when you can only film for minutes at a time. And things just get better from there from a high-speed motorcycle chase across the streets of France to a helicopter battle to a knock-down, drag-out bathroom brawl - it's all here and it's spectacular to watch. What's really funny is that the stunt that gave Cruise a broken ankle (and shut down shooting for several months) was a relatively benign jump between buildings. But, personal beliefs behind, Cruise is still one of the most badass actors out there, willing to put his body on the line to get things done. What's more, I love that the movie includes both Michelle Monaghan and Rebecca Ferguson as well - providing one relationship a fitting end while leaving the door open for something more. About the only weakness I can really point out is that I spotted all the tricks and twists without too much effort. Really, you can piece together how things are going to turn out with relative ease as far as I'm concerned because you can only pull off the realistic-mask trick so many times before it gets old. 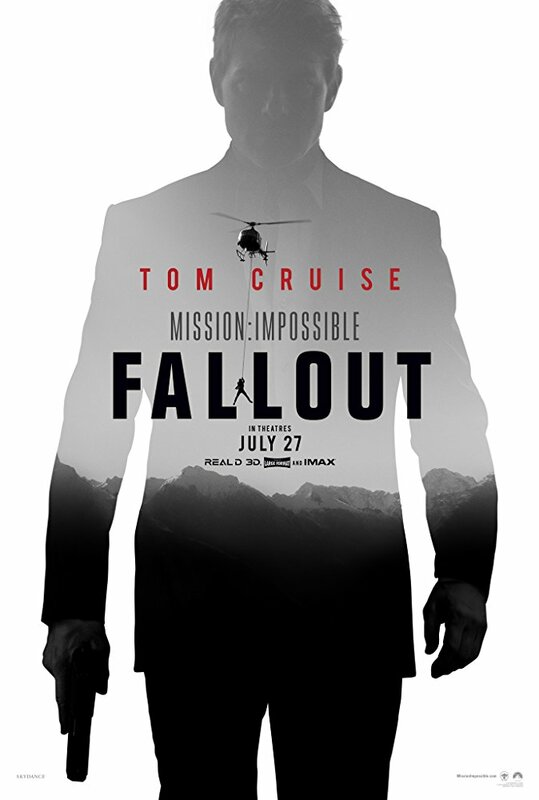 But that quibble aside, Fallout is, to me, the best Mission:Impossible film to date. Like a fine wine, this series just gets better with age and with the results its getting with critics and audiences, I have not doubt that Ethan Hunt will be back with another mission sooner rather than later.